Every VIB Member gets access to a members-only area on our website. We want to offer items we do not wish to publish as public access. Annual memberships also include an introductory t-shirt, 25 business cards, a membership photo ID card, and other items. We want to create an active community for obtaining and keeping our barefoot rights. We want to do so in a professional manner. If you were to be confronted while shopping, the employee may be shell-shocked that you have an ID card! Also, if we want our freedom, we realize we have to come together as a unit and do things to gain respect. Will this ruin our Facebook group? Absolutely not! However, at some point Facebook will not be as prominent. Also, the Facebook group will be geared for newer people, those who do not wish to have a VIB membership, and will continue to be all-inclusive. We simply want to make improvements within our organization. What is this Membership ID? Your laminated ID card will have your name, membership ID, and a head-to-bare-toes photo of you. The back contains a legal disclaimer, our toll-free number, and a QR code that leads directly to our legal web page. Why a head to barefoot in public photo ID? 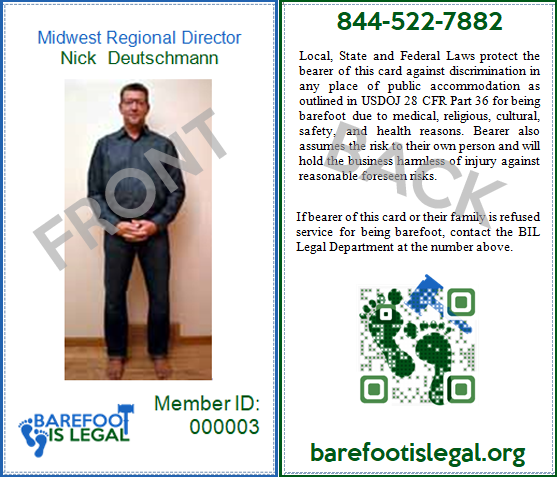 This photo ID will be on the front, going up and down, we want this to show everyone that we do go into businesses barefoot. We want to eliminate ALL aspects of people denying access to building over our barefoot choice. An ID will show that we are respectful, organized, and aware of our rights. Will this ID Always Work? There are no guarantees. The longer we are in existence, the more awareness and thus success we will see. With the barefoot in public photos on our membership IDs, we hope this shows we are just as normal as everyone else. The more people see us, the more we will gain acceptance. Can’t we do these things for free? Some items we CAN do for no cost. However, to rent festival space, get into health fairs, print literature, advertise, etc. all cost money. We will not be able to obtain courtesy booth rentals at prominent spots. Not many known musicians will help us organize an event for free. Simply put: If we want our freedom, WE have to show we want it. This includes putting your money where your mouth is. We are keeping the price reasonable because we want to help the most people. We do have to come together and work as a team to gain our freedom. This cost per VIB member is less than a breakfast combo at your fast food place monthly. Monthly will give you VIB membership access (but not the physical products). Only Annual subscriptions get the mailed merchandise. Your membership and/or donation pays for our 403(b) registration, bookkeeping, web space, artwork, t-shirts, and all materials that go into our mission. Our goal is to get funding for banners, fliers, and giveaways at health fairs, flea markets, and other outreach programs. As we grow, we will eventually do things other non-profit groups do. These include: music festivals, special events, and having an office with paid employees. Can I buy extra shirts? Only our annual VIB members can get this special shirt. Other shirt designs and merchandise can be purchased in our store. The approximate shipping for your country will be added to your order at check-out. We hate to see you go! You may easily unsubscribe by clicking this button.